Could we really see Dwayne Johnson run for president in the next election? As crazy as it sounds, the superstar continues to tease that it may be in the cards. Dwayne Johnson recently appeared at Stan Lee's Los Angeles Comic Con over the weekend to promote his upcoming movie Jumanji: Welcome to the Jungle, which arrives in theaters this December. He took the opportunity to briefly tease that President Rock may be closer to reality than we think. Here's what he had to say. "I think the 'People's President' has a really nice ring to it. I'll just say that." This whole idea of The Rock actually running for president started nearly a year ago. At the time, he said, "it would be a great opportunity to help people." But it was hard to know how serious he really was about the idea. Though, in subsequent interviews, he's indicated that he's much more serious about the idea and could actually be considering making a run for the White House. His recent statement was very brief, but while speaking with GQ earlier this year, he talked a bit more about why he's truly considering it. "I used to say it jokingly but every time I was asked, it was with a real genuine interest. And it was very earnest. And so I started to really think. Could I make a difference? Could I surround myself with really brilliant people to help me make decisions? Do I care about this country? And when the answers continued to come up yes, then I thought, there's a good chance. Yeah, one day. Then we'll do another interview like this." 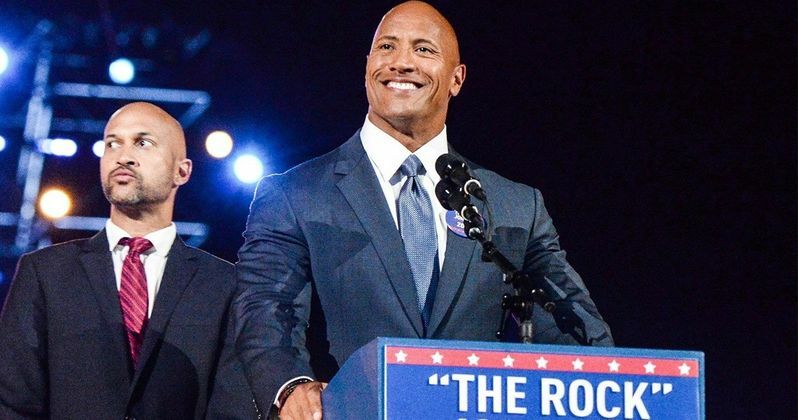 Even a year ago, the idea of Dwayne Johnson actually running for president may have seemed a bit more ridiculous than it does currently. The fact of the matter is, a former reality TV star is currently in office, so why not The Rock? He's one of the most beloved and recognizable actors on the face of the planet right now. Even though it may be for the wrong reasons, that would certainly give him a leg up out of the gate. And, not for nothing, but Arnold Schwarzenegger was, quite successfully, the governor of California. Though, he couldn't make a run for the White House, given that he wasn't born in the United States. The really interesting thing is that an organization called "Run the Rock 2020" has already formed and filed paperwork so that Dwayne Johnson could run, if he so chooses. For now, The Rock has his plate very full with upcoming projects, such as Skyscraper, The Jungle Cruise, the Fast and Furious Spin-Off with Jason Statham. Plus, he's got Ballers on HBO. Still, as Entertainment Weekly reports, he likes the idea of being the "People's President." Possibly more than he likes being a movie star.